Some students aren’t able to join our group classes due to distance or a scheduling conflict, while others just prefer one-on-one instruction. Private courses can be taken online, one-on-one with a great teacher over skype from anywhere in the world based on your schedule. A one-hour trial lesson is available. For people residing in Israel we offer private lessons at your residence in Jerusalem, Tel Aviv, Beit Shemesh, Be’er Sheva, Gush Etzion, Givat Shmuel, Haifa, Rannana, and Herzeliya. A one-hour trial lesson is available followed by the choice of a 10 hour mini-course, 15 hour half course or a full 30 hour course. We will match you with a tutor based on the schedule you specify. 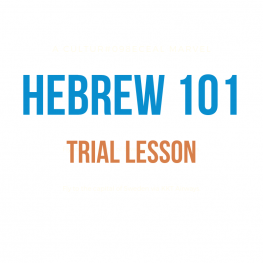 I was very hesitant to take an online course… but I must say that I am amazed at how much Hebrew I’ve learned in just 3 weeks. I liked the flexibility of doing the course from home.